While recovering from surgery, I thought it might be nice to get out of the house a little. Since I won't be driving for a while, Pete started up the Jeep and out we went on a search for abandoned buildings for my windows project. Pete gets credit for all the photos as there is not yet enough strength in my fingers to press the camera buttons. We had a great time and I hope you enjoy the results of our day out. A few years back there were multiple fires set in our downtown area. This building is a result of one of those fires. 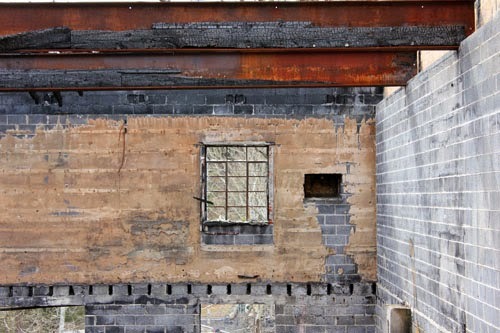 The charred beams show crackled wood still attached to the metal beams. 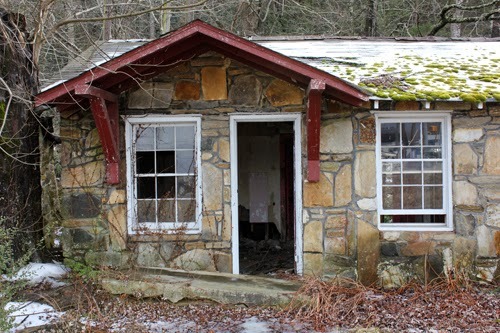 The window is missing its glass and leads to the view of tree limbs behind the building. The variation of texture on the wall around the window has been affected by exposure to the elements. 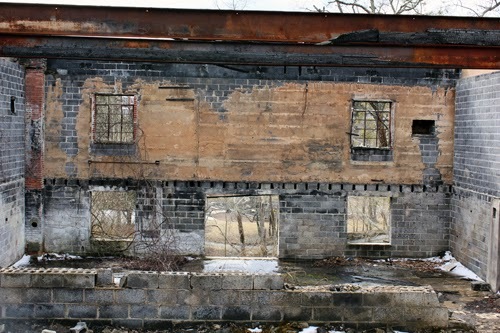 Here is a full view of the back wall of the building. The window to the left was used to create the design pictured at the top of this post. 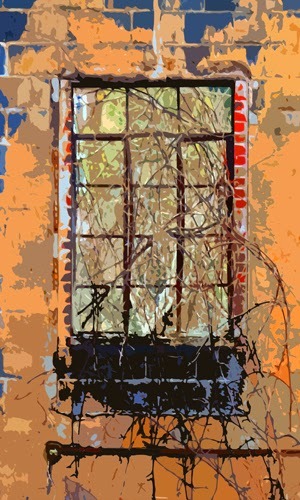 I love the vines growing on the inside of the window seeming to intermingle with the branches outside. Couldn't resist having Pete take this shot of someone's graffiti. Maybe they should have applied to be on "Street Art Throwdown". 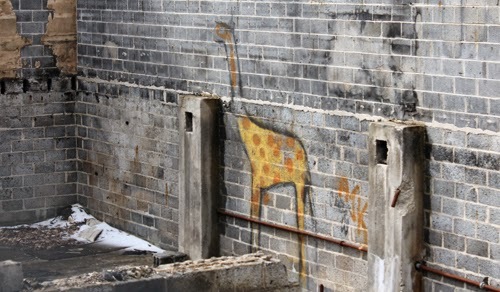 I love the spots on the giraffe contrasting with the rectangles of the cement blocks. 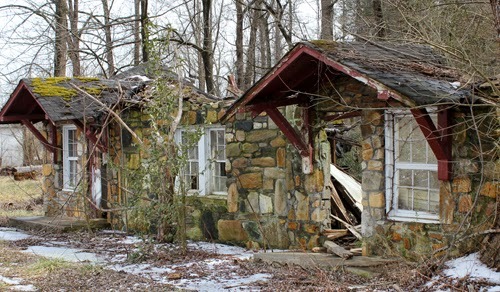 This is a section of an abandoned hotel down the mountain from us. 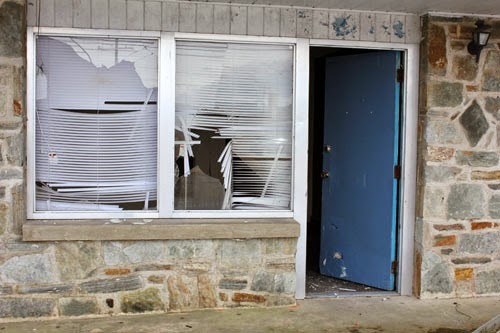 Unfortunately, vandals have broken into some of the rooms. The torn blinds and the vertical clapboard above the windows attracted me to this. It has the eerie feel of a place you may not want to enter. Cottages attached to the hotel have lost their roofing. Weather has led to quick deterioration. The window has a few glass panes left in it. Both of these windows would be good for study. 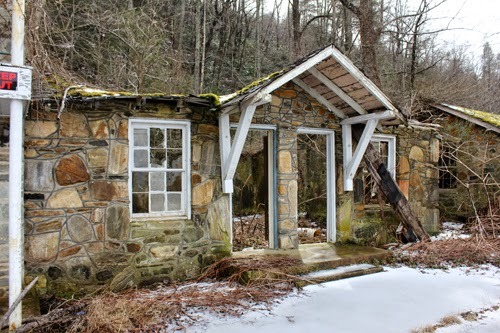 The right is partially opened with moss settling on the roof above it. In the design process, the moss could be placed on the window itself to add some age and color. The left window has four sections of glass missing which form a nice off-set square shape within the rectangle shape of the window itself. The variety of stone shapes on the building make a nice background. All that is left of this section is the facade, reminding one of a movie set. 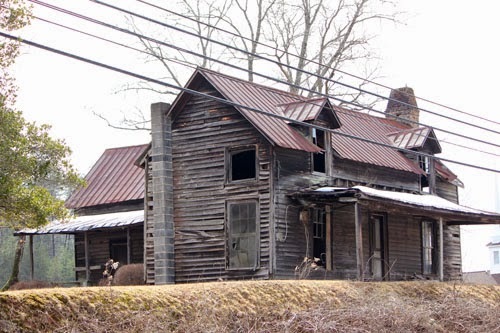 I've passed this old house numerous times and have not had my camera with me. We made a detour on our ride to go back to get photos. It is in pretty bad shape with part of the roof on the right peeled back allowing rain and snow to enter the house. 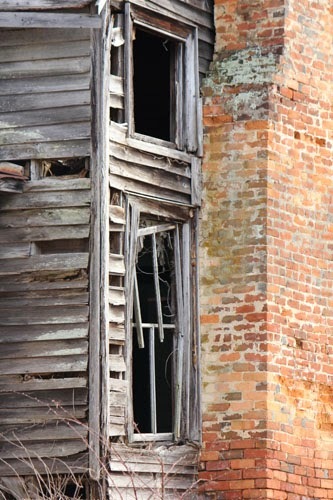 This is one of my favorites, a cropped shot of the side of the house. 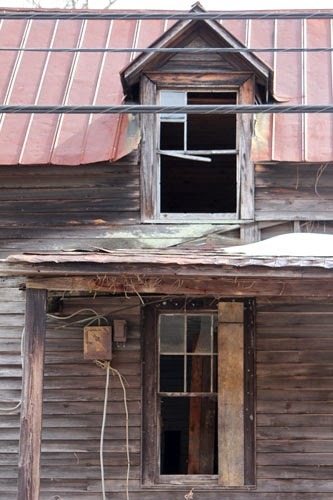 It is one of the first shots we've taken of a sagging broken window frame and will lead to a great design. The red brick against the white wood, which is broken and peeling, makes for a good contrast. We couldn't get a good shot of these windows without the power lines getting in the way. I like the old fuse box next to the bottom window, which is partially boarded up. The various shapes in the upper window, going clockwise from small to large, are intriguing along with the broken center board. One of the difficulties I'm finding in the design process is dealing with the large black spaces in some windows. I find myself looking for windows that have something different I can work with. For example in the photo above, the upper window has a red roof around part of it that could be exaggerated in color while the power lines could be lowered to travel through the bottom of the window, breaking up the large black space. Work with the challenges you find in the design process, make a list of your options to face those challenges and have a great day. I am figuring out ways to continue working with only my left hand. The actual punching is not bad, but threading the punch became a dilemma. 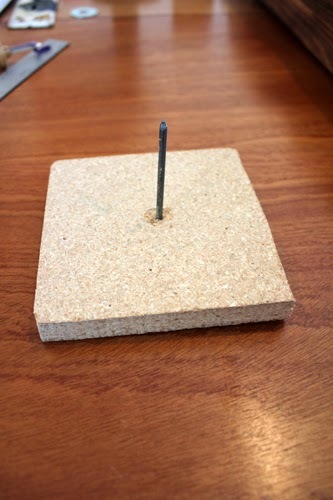 I hammered a nail through a piece of wood to set the punch on top of. This allows the punch to remain stationary so I can thread it with my left hand. Much better! Here is the result of rug punching practice. 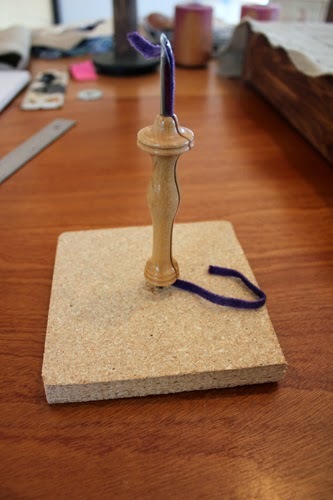 The loops will need slight adjusting but it is going fairly well so far. 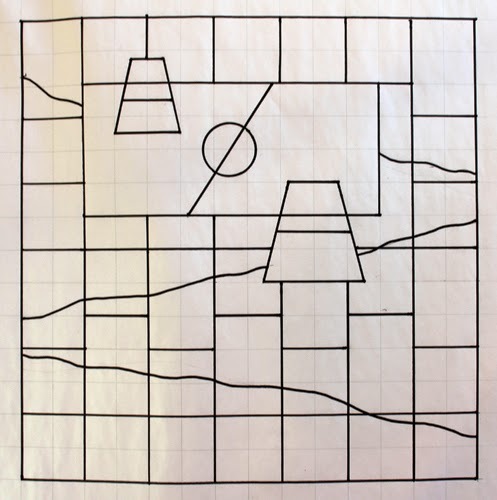 I wanted to get some new designs for the "Road Series" on linen this week. The two items above led to two different designs. The doorplate inspired this design. 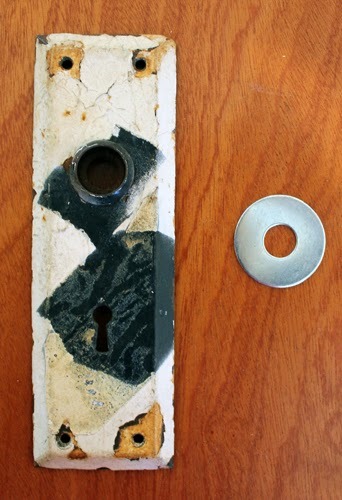 A friend I used to visit in college had a wonderful old doorplate on her city home, so with this memory in mind I knew where the design was going. There is something beautiful about the sparkle and glow of never ending rows of windows lit up throughout the city. I did not want the windows to be symmetrical, they needed to be slightly off. A half window on the far left and at the bottom create balance without matching the other windows. The actual doorplate will be placed in the rectangle on the left. The washer pictured earlier will go in the middle of the upper area of this design. We seem to have constant road construction on our main highway. There are detours, delays and endless orange barrels. This design includes a line through where the washer will go as a signal not to enter and a small and large orange barrel. 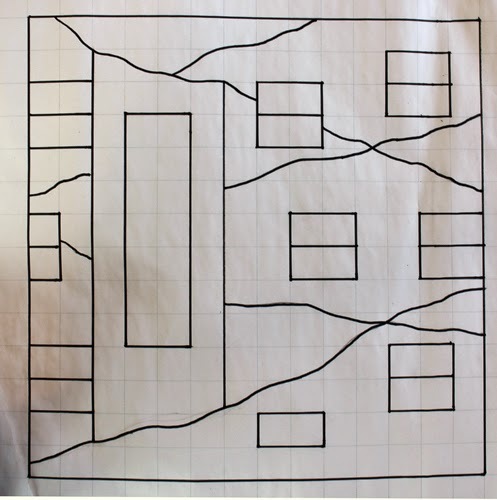 Again, the design is slightly off with the large rectangle further to the left than the right. Color will also be used to create balance in this piece. I have finally had to admit to myself that the turquoise green in the upper section of "Broken Glass" was not working. I was finding it just too boring. Brighter blue was used to randomly outline, dark green pieces of yarn were hooked in, but it just was not helping the piece come together. The turquoise green value blends in too closely with the blue next to it. The decision to change it to a darker value has been made. The contrast will create a better overall feel for the work. 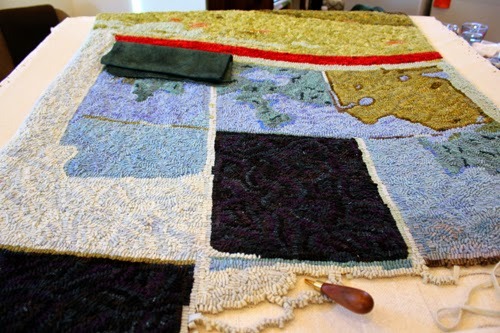 The new value will be slightly lighter than the dark green piece of wool lying on top of the work in the above photo. 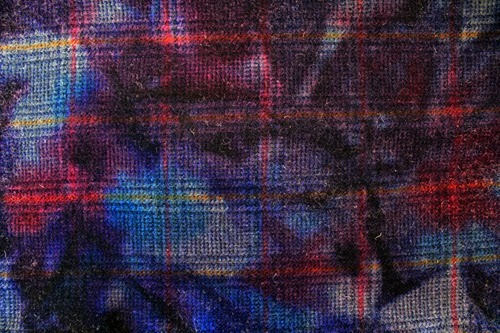 I also dyed over a blue plaid. 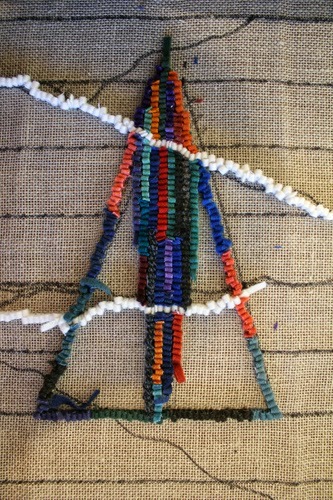 This wool will be hooked in with the black, brown and other dark values going into the bottom section of "Broken Glass". Find what inspires you to create new designs, never be afraid to admit that change may need to be made and have a great day.